demoting 64 engineers promoted during her regime under the reservation for promotion policy. A Cabinet meeting presided by CM Yadav yesterday approved a proposal to revert 64 irrigation and water resources department engineers and other employees reportedly in pursuance of a Supreme Court verdict of April 27, 2012. Mayawati, an ardent supporter of reservation in promotion both inside the Lok Sabha and outside, today charged the SP government of misleading people on this score. “The Supreme Court had not disapproved of reservation in promotion. It had only laid down stringent conditions for it. Instead of following the condition, the Samajwadi Party government has completely done away with it,” said the BSP national president. Charging the state government of “nepotism” and undue prop up of Yadavs at the cost of other backwards, Mayawati said it was this unbridled promotion of Yadavs that had led to “jungle raj” and all around lawlessness. 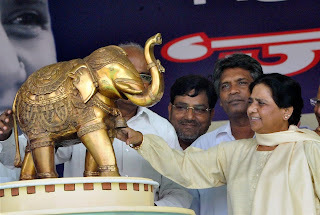 Responding to a question, Mayawati hit out at both the Prime Minister Narendra Modi-led NDA government at the Centre and the SP government for indulging in ‘natakbaazi’ (theatrics) to lure the Dalits. She was speaking in the context of the Central Government planning to include biographies of Dalit icons and social reformers in textbooks and SP’s proposed “Dalit Sammelan” in Azamgarh. “The people can see through such natakbaazi. The NDA government is sub-contracting all work to private firms where there is no reservation for SC/ST. Here the SP government is demoting SC/ST employees. The people can see their intention. Let them decide their fate”, she commented. Demanding an impartial CBI inquiry into the Vyapam scam, Mayawati said for the sake of transparency and objectivity, CM Shivraj Singh Chouhan should resign. She said the Vyapam and Lalitgate controversies had conclusively proved that both the Congress and the BJP were at the same level as far as corruption was concerned.